Choking traffic jams in Metro Manila marked the recent holiday season. Credit the city’s denizens who looked at the brighter side of things by immersing themselves in the sights and sounds of Christmas – such as Christmas carols, or a glimpse of elaborate decorations and thousands of gleaming Christmas lights around the metropolis. The Manila Electric Company (Meralco) pulled all stops last month with its annual ‘Liwanag’ park at the company’s headquarters at Ortigas Center in Pasig City. 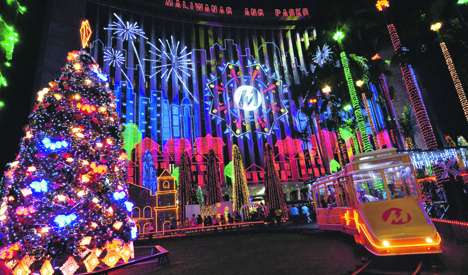 The concept was part of Meralco’s ‘Maliwanag ang Pasko’ (MAP) project. The Liwanag park showcased a dazzling façade of the main building with a smart city theme as a bright exterior covered with colored lights synchronized with music in a show that played every 30 minutes. Visitors got on an electric train, which ran on an oval track. They also walked through a maze, just one of the many Instagram-friendly draws on hand. During weekends, a bazaar and food stands were set up at the side of the main building.